IDI - Gravitational Power Full Disclosure - Full Schematics and Explanations Here! A few months ago i was inspired by the Spirit of God to come up with a machine that will benefit all people and will expand the knowledge of the humankind. This machine, while very simple, 7 main components, can tap into the energy field of the planet and produce useful work that can be transformed into "electricity" or can be used directly to pump water, compress air or can be used as a fan to cool you in the hot summers. Unfortunately i have no money left to continue this research, so i've started this GoFundme.com campaign but more importantly then you giving me money is that you take this research and get it to the next level. The machine that i'm trying to build is named IDI, Infinita Dumnezeiasca Iubire, in English this would translate as The Infinite Godly Love, and works due to gravity, some might call it a gravitational engine but what it is i explain into this and other videos. Please spread this video around, download it, reupload it mirror it, else it will be taken down! IF YOU WANT TO HELP ME FINISH THIS CONSIDER MAKING A SMALL DONATION HERE! did you write down what you have done anywhere on the web ? would you put it into text here if you have not ? Ok, i will do that as well, but need some sleep first...i will do it later today. ok, let me see what i can do with pictures. Can you at least install Algodoo? Ok so what you see here are 2 circles (gears, but they don't have to be gears, it's just easier/faster to use them in algodoo) that have each 4 rings, very important. Each ring allows us to polarize inside of it. Also the gear axles need to be away from one another so a difference in potential can manifest. In the picture above you see the gears overlapping but that's only because it's a 2d plane, so in algodoo you can overcome that by using collision, the software allows this by right clicking on an item. 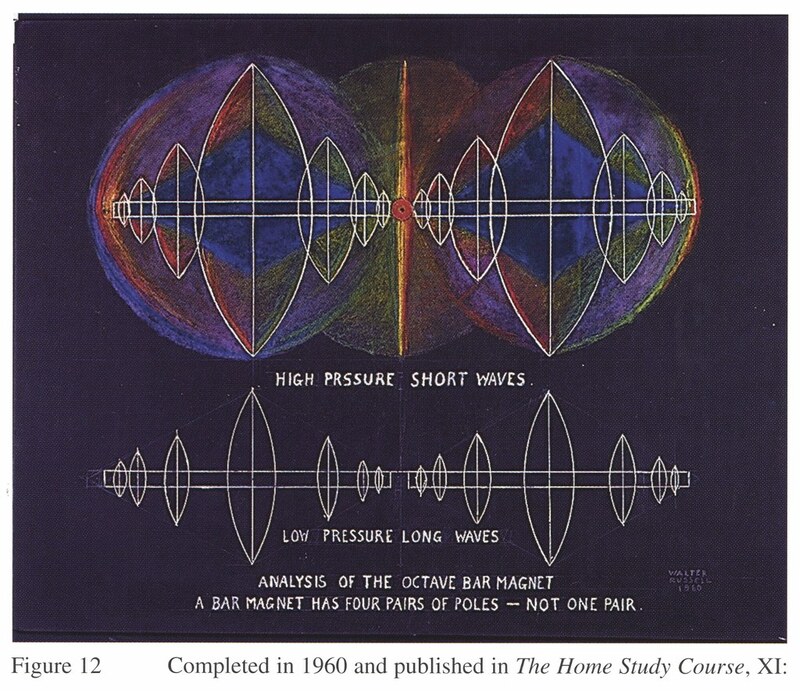 Check this one out, Walter Russell explanation for a bar magnet. So, basically what we have is a magnet, lol. Now we need to use and align our magnet to the planet but first we need to capture a potential. Our potential is "weight", but our weight is polarized only one way on it's return to equilibrium. Apparently pulled by gravity, at least that's how some explain it. Or falling, or whatever. What actually happens is that it is in it's compression cycle returning to equilibrium. So it's actually a -- or +- if you want to call it like this. So in order to be able to use this captured potential, we need to split it. Some people in the alternative energy research talk about splitting the positive. In this case we split the negative. But what is positive and negative for a weight? well like i said, if you take it as it is, the "weight" is polarized only one way but if you put it in a system like a "Mechanical lever" it will express itself, more visibly, cause it expresses itself this anyway but by pushing/pulling air in it's path, but that's invisible to the eye...it will express itself it's positive and negative. BUT IT WILL ALSO REVEAL ONE THING AS WELL THAT PEOPLE KEEP IGNORING! and that is EQUILIBRIUM! So in order to split something like a positive or a negative correctly we need to create not only it's EQUAL counterpart but also it's EQUILIBRIUM. And we do it like this. Ok so now we got our "Magnet" or "circuit", the 2 wheels with 4 pairs of poles, and our captured potential, witch is a "lump" of electricity actually, expressed correctly, with it's male-equlibrium-female sides, or positive-equilibrium-negative sides. So we connect our circuit to the planet, the planet is the 3rd wheel. But there is a right way and a wrong way to to this. The right way is in the first picture in the post. The wrong way is this! So you will probably ask yourself what is the difference. Well, one works the other doesn't and the reason for that is because in one system, the first one, we have polarized our 2 "virtual" points in our circuit by placing them on 90 and 270 degrees of the rings, where the maximum power is, perpendicular to our gravitational equilibrium line, if you like it like this, and in the wrong version we didin't, the virtual points are at 0 and 180 degrees, where there is no power. if your able to install algodoo and make this little experiment things will become very obvious to you since now you have this explanation and you will be able to see it and play with it. I don't know how much more i can do with words and pictures but i will try. in 3d it looks like this. what is it all made out of ? steel ? aluminum ? and just to be clear, your small offset spinning weights, are they magnets or just mass ? Making a simulator move on its own continuously just using gravity is pretty impressive! What do you mean the third wheel is the planet? Can you draw a 3D version with a frame and axles.... I am struggling to tell what is what. I think you are saying that the position the weights are connected to each wheel is how the wheels are trying to obtain equilibrium but never getting there. can be made of any material but i will say this, the rings should be coated with metal and oiled as the 2 "virtual points" else u'll end up with all sorts of issues. So if you make the wheels out of wood, witch is fine, if you can, coat the rings aka the holes on the wheels with some metal or shiny plastics that can be oiled properly. you can do this by cutting some rings out of some pipe and polish it a bit. I wouldn't waste money on steel or aluminum at first anyway. try and see the videos i made. But be aware in the 3d simulations i used rectangular shapes for the arms, they should be round aka cylindrical so they can slide easily. Be aware, they need to go up and down at the same time from their equilibrium easily. hmmm, look at Walter's drawing, look in the middle, do you see the 3rd circle? So you got 1 circle for each, 1 for negative, 1 for positive, 1 for equilibrium. So what we do is hook up our machine on 1/3 of the planetary cycle. But since is 1/3 we need to provide the other 2/3, hence 2 wheels. I'm sorry if this doesn't make much sense for now but it will. And it's important to start to understand what is really going on here in order for you guys to come up with your own designs. That's one way to look at it, but it's more then that. I hope i will master the language to be able to explain things in a cleared manner. I'm glad you like it though, been some rough months for me. i'll try and design all parts for a small scale prototype, but you guys should let me know what yo have access to in terms of tools and materials. Else unwanted complications can appear. I think you should keep doing what you are doing and explaining. A better 3D picture would explain a lot more. I can't figure what is connected to what. This is going to work really well with my permanent magnetic bearings!!! As someone who has designed several things in Algodoo, the algorithms in this 2D software don't always translate in the 3D world. i know, the thing is that i used another software as well and i'm trying to learn other 3d programs that have physics integrated to do more simulations. Also there is someone that had some success following very similar approach but offers quite a different explanation. Found out about him a very short while ago. and this might me his website, that's in German and i don't understand that much to be honest. but has some very interesting pictures. He talks about an oscillation, something that i also noticed in the simulations, there is an oscillation in the arms that must take place between the "virtual polarities" on the wheel that must take place easily for it to go smooth. What i know for certain is that this is possible, and for now i'm quite convinced i'm on the right track. There might be something missing still but since i can't do much in real world for now i'm stuck in the virtual one. And to get back to that guy he said that shortly he will present his discoveries to all of us, but when will that be i do not know. Anyway check his channel. On this channel there is a guy talking about a clue that he found in an old book about Bessler wheel. His approach to this clue, his explanation, i believe to be incorrect as what he proposes i know it doesn't work. Even so i find it curious enough that he talks about what seems to be 2 overlapping circles, disks, wheels. Very similar to the design i found to work in the simulations. i'll start working on a new approach that should make things obvious and will eliminate any possible collision bugs. I hope i can finish this before the war starts, this sick bastards really wanna get rid of all of us, and people are so silly that they are falling far it. There is a global war on for our minds to allow World War 3 to happen. The banking families are desperate for total control and we have a small window to stop them which is to take away their power over us which is energy creation. I don't doubt it Paul. But Visitor said they want to get rid of us all. If they get rid of the 'worker bees' where will their wealth come from? DARPA has been working hard to make robots to replace us. From what I’ve seen this is funded massively via Google advertising. Have you seen the Georgia Stones?